This app is an enticing colorful way for kids to learn ABC’s! It is a play based model and provides endless play in tapping numerous objects to hear the sounds and names. Hours of playing (learning) that never gets boring! Several versions of the ABC song are included! 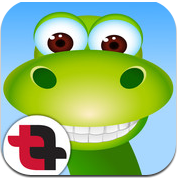 This app is presented by tapfun. Tap to your heart’s content! Sing along with the ABC Song! What was the initial inspiration for First Alphabet? My initial inspiration for First Alphabet was the idea that I could create a better ABC app for toddlers and preschoolers by including true play and discovery for each letter of the alphabet. As I looked at existing ABC apps and compared those to research around the importance of play and discovery, I knew I could create something unique. My favorite aspect of my app is the unlimited approach to play – for example, on the letter T scene – kids can launch an unlimited number of Turtles across the screen and interact with each one in a distinct fashion. Further, they can launch seagulls on the same scene and play with them too. This element of open play that is driven by the user is my favorite aspect of the app. I also have to add, I think the illustrations and animations are very cute! We value feedback! We rely on community input to improve our apps so please share with us what you like and how we can make improvements. You can contact us via our website . Links are available through iTunes. Thanks so much.